Once again I am struck by the words “We black people can’t organize ourselves” announced by one of the village youth leaders yesterday after she heard about some confusion regarding a community meeting. “So you think black people the only people who like confusion?” I ask. “Well this is what I know and see and I don’t know about other places” she responds. My friend laughs and says “Yes but black people especially”. The Dali Lama was shocked and saddened. He said, “If that kind of mental attitude exists then there is no way of transforming society. Impossible.” The Dali Lama argued with the man and spoke of his own experience and the successful human communities the Tibetan people were building in India. He told the teacher, “We are equal! We have the same potential! We are all human beings! The difference in the colour of our skin is minor. Because of past discrimination, you didn’t have opportunities; otherwise, you have the same potential.” The teacher began to cry and assured the Dali Lama that he now believed we were all the same in being human and sharing the same potential. I guess anyone in the presence of the Dali Lama and hearing these words would transform his or her way of thinking on the spot. Relating this message from someone like me, a white humble dreaded lady who paints pictures of love and hope and teaches peace-building skills to children is a different sort of messenger. One without much pull but one, who spills out her thoughts anyways. Have a safe mindful celebration saying goodbye to 2009 and making room for new beginnings. Joyous and justice filled new year. breeze is blowing; neighbours calling "morning" from open windows; maya and samara playing moral, a ball and hopscotch game combined; theo is cutting grass for the cow and i am here spilling words onto my blog so that i continue to make this a regualr writing practice. i jot down quickly two surreal images from yesterday reflecting maya's two worlds: maya sitting crossed legged on the floor reading outloud the back of Snow Buddies, a dvd she received from Grandma for christmas. She is asking me if we can go online to purchase free movie offer, freaky friday. Meanwhile theo is calling her, "hurry up and put on your boots and lets go cut vine for the goats!" maya jumps up and runs for the machete at the back door and hands it to her dad. Second image last night maya creating mosaics of walt disney fairies and complaining to dad of the baby cockroaches zoomimg by. theo hands her my running shoe and instructs her to squash them as they pass. i glance around the corner and see maya poised with her weapon in the air and at the same time bent over her sparkly fairy mosaic. The two of them together radiate two worlds belonging to One!!!!! 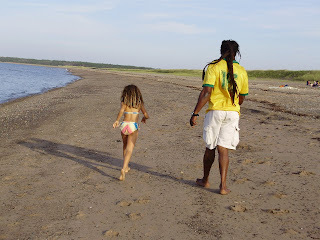 ps: picture is at Pomquet Beach Nova Scotia this summer. m.
Maya was born on Christmas day here in the village in our tiny board house eight years ago. Yesterday we celebrated her birth with friends from school and the village crew! Eight years ago on Christmas Eve I walked up and down the laneway breathing and counting the spaces between contractions. They were too far apart to hustle our midwife to the house. Theo went up the road to hang with his brethren to ease his nerves while I continued slowly walking and watching the kilometers in between contractions. The rest of the non birthing people on the island were either baking, hanging curtains, cleaning house, feting in towns or shops or simply settling into the eve of Christmas. I knew I was tossing privilege to the wind but at the same time I also knew that women have been giving birth at home for centuries and that complications happen more frequently in hospitals because of the unnaturalness of birthing in a sterile white walled institution (yes I realize this too is a privileged opinion). Maya would not arrive on Christmas day as this was the time that people drop by for their sorrel or ginger beer or black cake or malt or guiness or any thing baked and ready to eat. My water broke early Christmas morning and Maya arrived Christmas day at 5 pm. By the time Theo finished cooking pumpkin soup maya was peeping out into the world with the crowning of her head. Marguerite our midwife called Theo to come and Theo gracefully, skillfully guided maya into the world. Pin the tail on the donkey stole the show away. There was a line up of kids (about 25) down the stairs and onto the laneway waiting their turn to pin the tail on the donkey that looked like a sheep. “nah man that looking more like a sheep!” says samara. The donkey sheep was pinned to the outside of the house on the veranda and each child was blindfolded and handed a donkey tail that looked like a candle. The kids squealed with fear and delight to be blindfolded and in charge of finding the but of the donkey. We also had a Christmas caroling competition with each group performing their favorite Christmas carol and plenty of circle games. The party ended with: over 25 kids squished onto the veranda and into the house bellowing happy birthday and watching maya blow out unblowable candles; the cutting of double layered vanilla and chocolate cake that maya, samara and I made that morning; spooning out of ice cream from the back door by Theo; and Kayla distributing popcorn and treat bags. The kids went home with sugar filled bellies and loud rolling voices that started a moment of confusion with other older kids who were sitting on the road down below. Recently a friend of mine described my Art Work as Heart Work and it made me think more seriously of why I do what I do: paint human beings celebrating their lives, their selves. I often reflect on the words of feminist activist Emma Goldman: “A revolution without dancing is not a revolution worth having” and I know this is the undercurrent moving through my work. Images of Bishop Desmond Tutu also permeate my thoughts as I see him dancing freely up on stage at a ceremony I saw a few years ago on television. I remember thinking here is an image of hope and resilience in the face of unimaginable pain and grief. My Grenada family friends and community are the foundation of my Heart work. They have taught me hope, strength, resilience, courage and resourcefulness in the face of life’s difficult moments. I have learned and continue to learn the fine balance between hope and despair and the power of music, dance, storytelling, poetry, and laughter in healing and revolutionizing. I left Canada in 1993 to work overseas for two years with a small non government organization from Toronto. However before making this two year commitment I set out on my own after completing my Bachelor of Arts degree and traveled. I traveled for 10 months to Thailand, Nepal, India and Indonesia. It was while traveling through some of the more poverty stricken areas of these countries that I began to understand what privilege meant. I was one of the privileged. I struggled with this more in the realm of guilt rather than understanding further why I was privileged and how that privilege worked for me. It wasn’t until I moved to Grenada that I began to transform my guilt of being privileged to a more useful emotion that of anger and then compassion. I began to look at this world with a more critical eye. I started to ask the question “why?” which continues to be my method of critically analyzing the unjust systems that create such a wide gap between the privileged and the non privileged. I began to ask: “Why was I born with so many choices and opportunities and my brethren and sistren in the village were not? Why have I been dealt the winning hand of cards that lets me pass go over and over while many friends in Grenada and throughout the world struggle daily just to survive each hard day. I soon realized the more we are given in this world the larger our responsibility is and therefore I began to use my life in a more responsible and conscious way. I began to work more consciously on my self so that I could be of better use to the world and began to explore my own potential as an agent and ally of change both within myself and within the outside worlds that I found myself. I began doing this while working with a community women’s group in Grenada that came together to teach one another various local crafts. I worked with adult literacy branch of the national college in Grenada and helped incorporate within a women’s craft group a literacy component that led to facilitating a process of personal and group empowerment. The program involved women exploring, discovering and exercising our inherent power to create changes in our lives and within our communities. We wrote letters of protest to the local newspapers concerning police violence against women, we performed community dramas addressing various forms of violence within our society, we wrote our life stories and shared with others in a booklet style; and we created a story quilt which we exhibited at local art and craft shows. After the program ended there were many examples of how we found our inherent strengths and potential to effect change. For example one of the participants went back to school to finish her School Leaving degree and pursued her dreams of becoming a nurse; another participant became a leader in her own community and formed a community group of women crafters; another participant filled out various forms for visa applications and traveled to Canada to visit her mother; and another participant began selling her craft to local markets. I too found a renewed sense of self and started exploring the power of self and community on canvas through painting women celebrating their lives. I began to paint the strength, courage and resilience of women I experienced on a day to day basis in Grenada and these same women kept showing up on canvas over and over which led me to a particular style of colour and figures. This style of movements represent for me, the power within we all possess, even in the face of life’s hardships, tragedies and difficult moments. With encouragement from friends in both Grenada and Canada I began to show my ladies in various venues and they began to take on a life of their own and somewhere within all of this became a source of income for myself and family but also a source of income for community youth peace projects in Grenada. This past year the Harford Village Peace Workers were formed. The group formed in response to the rising violence amongst youths on the island and within our community specifically. We are a small group of four youth leaders and two elders from Harford Village. The main objective of peace programs is to provide a safe, positive and child friendly environment where kids feel safe, respected and valued while engaged in various activities that promote living values such as peace, conflict resolution, self love, empathy, respect, gratitude and other living values that promote a culture of peace. Kids are encouraged to learn and practice youth-centred conflict resolution and peace building strategies using various expressions of art, including dance, spoken word, story telling, drama, visual arts and in the near future photography. Plans for the future involve strengthening the connections between my art/heart work and community empowerment programs. I plan to write more about my experiences in Grenada in order to create a broader awareness for the need of teaching peace side by side with various artistic expressions. I want to explore further the empowering effects of art and its ability to create cultures of peace within our selves, our families, our communities and our world. I give thanks and praise to these vibrant, moving, healing, empowered, strong, courageous women that continue to stroll, dance, drum, cartwheel, raise fists in solidarity, and simply move through me and onto the canvas! They continue to be a great source of strength courage and healing as I dive deep into many different world’s and experience the fine balance between hope and despair. For every native of every place is a potential tourist, and every tourist is a native of somewhere. Every native would like to find a way out, every native would like a rest, and every native would like a tour. But some natives- most natives in the world-cannot go anywhere, they are too poor. They are too poor to go anywhere. They are too poor to escape the reality of their lives; and they are too poor to live properly in the place where they live, which is the very place you, the tourist, want to go- so when the natives see you, the tourist, they envy you, they envy your ability to leave your banality and bordom, they envy your ability to turn their own banality and boredom into a source of pleasure for yourself. I do enjoy our Sundays. I do enjoy meeting new people and sharing my work and escaping briefly my own chosen life here in the village and plunging into lives that are not so hard hit economically, historically, socially. I enjoy temporarily escaping the reminders daily of how hard people’s lives are here in the village and witnessing daily the effects of a tragic history of violence and oppression, that shows itself through the hard slap a small child gets while walking up the road because she is crying too much or the lashing out of words from a young boy frustrated “I go chop you” or hearing that another neighbour fainted in school because the teacher beat her; or remembering the time our friend got so frustrated with one of the village youths he took a large piece of wood and gave the boy a few lash and then pinned him down by the neck until we started yelling to let the boy go. Of course this is just one side of the village and even though the hardness is a constant here there is also a billowing softness that presents itself in watching a young man with a day old baby cradled in the nest of his arms walking in the early morning sunshine; or the kids gathered around an elder while she tells them of days gone by when tamarind was sweeter and breadfruit a daily gift from the nieghbours; or the greetings everyone distributes while pass one another in the road like “guidance sister” or “ blessings from the Most High” or “take your time friend”. There is a great sense of strength, resilience and connectedness here which is radiant at this time of year when christmas is a community affair. Today is the day I begin my blog. Today is the day I face this fear of writing publicly. Today is the day I shed my shell and become soft and vulnerable sharing the inside out. Today is the day I create an intention to these blog pieces. My intention: to share bridges between many worlds through the writing process. Bridges between: art and peace education; community and self; Grenada and Canada; the Village and the Farm; confidence within and confidence with others; and the many other bridges waiting to be built through these pieces. Yesterday I miraculously pressed a few buttons on the computer that led me to Skype. I signed up again and went online to see if dad was on his computer. He was. I remembered a friend of his hooked him up to skype even though he hasn’t a clue at the moment how to use it. I dialed him and he miraculously pressed another button which led him to a video of me maya and samara staring stupidly at the screen wondering if he was actually on the other end. We couldn’t hear him because he was not signed in but he could see us as I soon found out when I unhooked the computer and called. He said he heard a strange beeping, pressed a button and there we were in our little board house dancing around. We hung up and I rang him again this time knowing he and mom could see us. I moved the laptop around as best I could with all the different wires hooking me from one connection to another. We brought our various animals to the screen, Blossom our cat, Sara and Lola our dogs and Lilly and Fawn our adolescent goats. Maya danced in front of the screen and samara stared shyly while laughing her gorgeous laugh. Theo stood at attention with his hands behind his back grinning. I never thought I would feel such gratitude for the madness of our internet worlds.